SUN-FLEX® is a company with focus on developing, manufacturing and distribution of products for the modern office workplace. We have over 30 years of experience and understanding of the modern office workplace. With that, SUN-FLEX® have gained a respected leadership position in the industry. SUN-FLEX® has a strong international presence and is well represented in Asia, Europe and North America through a refined network of distributors and dealers. 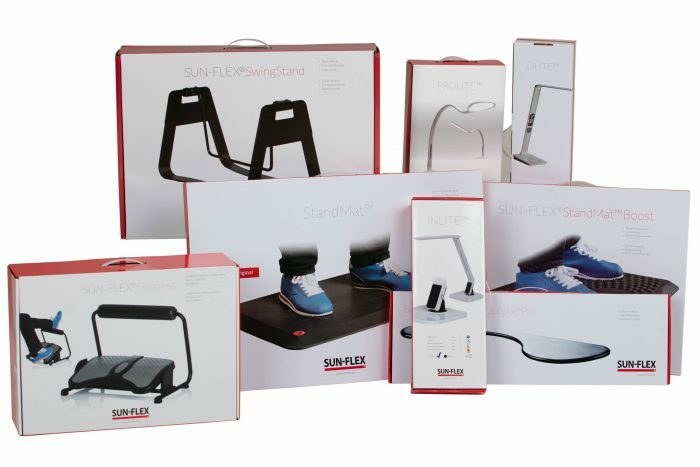 SUN-FLEX® products are designed to improve wellness as well as productivity in the workplace.SUN-FLEX® provides user-friendly solutions to common problems found in most offices. SUN-FLEX® is working relentlessly with developing not only the best products in the market but also providing our partners and customer with the opportunity to develop together with us. The SUN-FLEX® brand is one of many key components in our model and thus leads us through all processes including customer relations, products, packaging, shipping etc. For SUN-FLEX®, nothing but the best is good enough. Expansion to Denmark, Norway and Finland in 1987. Expansion to mainland Europe in 1994. Starting own product development and manufacturing in 1996. Expansion to North America in 2000. Moving of HQ and warehouse in 2005. Starting our own office and warehouse in China in 2012.